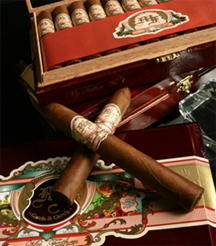 My Father cigars are handmade from select tobaccos grown by Jose 'Pepin" Garcia for himself at My Father Cigars, SA - one of the most prestigious farms in Esteli, Nicaragua. Jaime Garcia, Pepin's son, produced the medium- to full-bodied, complex blend of rare, sungrown Ecuadorian Habano-Rosado wrapper and Nicaraguan filler and binder, then named the blend "My Father" in honor of his father. The beautifully constructed My Father cigar is a highly-rated powerhouse of smooth, rich, deliciousness from beginning to end with notes of toast, woodiness, and nuts.